I had no idea how influential my sister-in-law, Emily, was! Check out this LINK to see why. 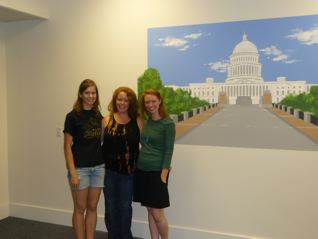 She was asked to paint a mural for Kansas Senator Jim Barnett for his campaign race for Congress. I would say that's a resume builder if I ever saw one! That takes ridiculous talent to paint such a large mural and it turned out so amazing. You have to check out the video of her being interviewed by the local news station in the link posted above and see it for yourself how talented this girl is. I'm so proud of you sister!! LOVE YOU! How cool! Your family always has the coolest stories. Impressive! Beautiful mural...I'm off to watch the video!